In Winterkill, Todd Davis, who, according to Gray’s Sporting Journal, “observes nature in the great tradition of Robert Frost, James Dickey, and Jim Harrison,” offers an unflinching portrait of the cycles of birth and death in the woods and streams of Pennsylvania, while never leaving behind the tragedies and joys of the human world. Fusing narrative and lyrical impulses, in his fifth book of poetry Davis seeks to address the living world through a lens of transformation. In poems of praise and sorrow that draw upon the classical Chinese rivers-and-mountains tradition, Davis chronicles the creatures of forest and sky, of streams and lakes, moving through cycles of fecundity and lack, paying witness to the fundamental processes of the earth that offer the possibility of regeneration, even resurrection. Meditations on subjects from native brook trout to the ants that scramble up a compost pile; from a young diabetic girl burning trash in a barrel to a neighbor’s denial of global warming; from an examination of the bone structure in a rabbit’s skull to a depiction of a boy who can name every bird by its far-off song, these are poems that both celebrate and lament the perfectly imperfect world that sustains us. 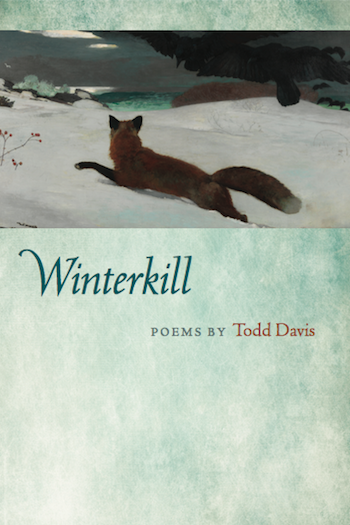 "Todd Davis's wonderful Winterkill has just the right balance of reverence, precision, and quiet indictment so the book becomes, if you will excuse the overly simple word, a book about living. Which means it does not shy away from death, or the predatory, or the speaker's involvement in nature's processes. Davis brings an evenhanded exactitude to everything he so artfully describes, even to those who despoil that which he loves. That exactitude indicts better than any soapbox shouts would. Later in the book, Davis brings the same fine precision to his dying father, and with a compassion that asks from us no more than the entire book does: our attention and assent." "In Winterkill Todd Davis is blessedly careful with his subjects, finely nuanced with his themes, and respectfully alert to the details of the land, the settings, the lives and the ending of lives throughout the book. With varying visions and within different circumstances, the poems present perspectives on the constant presence of “the beautiful threat / of death / from on high.” It is possible to read through these poems without stumbling, without faltering, without confusion, allowing and trusting the talent of the poet to carry the thought and experience. Davis accomplishes this beautifully with insight and passion."